Hard Work Hard Money is the highly anticipated 2nd studio album from NZ's first and finest second line band: Richter City Rebels. Rammed with their signature explosive beats and good-feel vibe, Hard Work Hard Money follows 2016's Live at Tora, another joyful and juicy plate of strong, rich New Orleans fire. Presented courtesy of Abandoned Brewery. One-night-only music and merch specials. 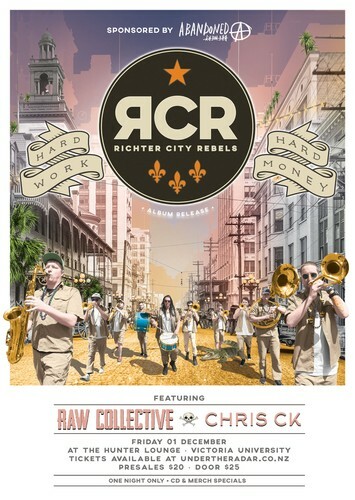 The Richter City Rebels have a sound that blends RnB, soul, hip-hop, jazz and funk with the heart and soul of New Orleans brass band music. Trumpets, trombones, saxes, sousaphone, and percussion bring the ultimate Mardi Gras party to any venue or festival. Incorporating stylish original melodies and shouts, funked-up pop tunes and bouncing hip-hop, the Rebels’ sound embodies the musical melting pot of Louisiana. Raw Collective are a 10-piece live Hip Hop band from Wellington, New Zealand. After forming in early-2014 have spent the last few years touring NZ, honing their live show, and releasing music. First came their debut Wise Horizons (6-track EP), and then the single 'Coins (Memories)' with an accompanying music video which gained #1 on RadioActive.fm for 2015. 2017 has seen the band put the finishing touches on their debut album, and the release of their latest single 'Don't Leave Your Luck' a driving hip-hop jam to be followed by the uptempo 'Smash the Grips' an inquisitive look at some of the band's motivations.